Naval Dockyard, Mumbai has called the candidates to fill up 318 vacant seats for Apprentice post. The Naval Dockyard applications were made from 04.09.2018 to 25.09.2018. Candidates have applied for Naval Dockyard Apprentice Recruitment 2018. Now, it is going to conduct the written examination. Applied candidates have to participate in the Naval Dockyard Apprentice Examination 2019. To appear in this examination, candidates need to carry their Naval Dockyard Admit Card 2018 which will be available on the official website to download. They need to implement some required information to download Apprentice Hall Ticket. The ordered data is the username and password. Candidates can download it directly by clicking on the below available link. The Naval Dockyard Apprentice Examination will organize on 24th Feb 2019. Candidates should download their admit card before some days of examination so that if there will any problem or error, they can discuss with the organization. The admit card is available now. 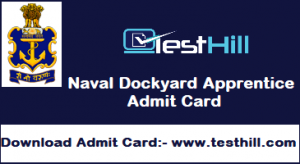 Naval Dockyard Admit Card 2018 is a very important document for all applied candidate. Candidates should download it from the official website. Applied candidates who are going to perform in the written examination, they need to take the Apprentice Admit Card 2018. Because without admit card, applicants will not be able to enter the exam hall. An admit card is key to participate in the exam. Applicants need to implement some required information like username and password to download Naval Dockyard Apprentice hall ticket. Admit card holds some important information regarding candidate and exam-like candidates name, candidates parents name, test venue address, exam date and time etc.